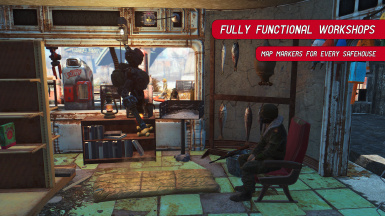 Adds a map marker and functional workbench to every Red Rocket in the commonwealth. This is a simple mod that adds a map marker and a functional workbench to all of the Red Rocket locations. This mod is aimed for people using Survival Mode that need a few "pit stops" through their travels. 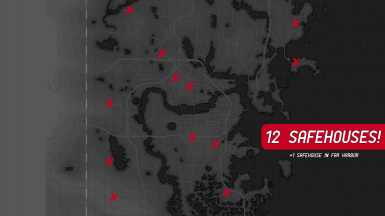 There are a total of 13 "Safehouses". The 11 vanilla Red Rockets in the commonwealth have been converted to safehouses as well as 1 custom Red Rocket and 1 Red Rocket in Far Harbor. 2.1 - The Red Rocket in Far Harbor has been converted to a Safehouse. 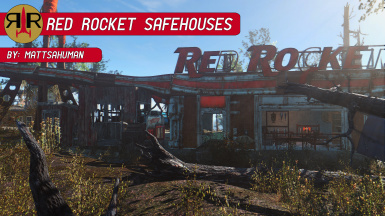 A new Red Rocket has been added in Salem and is a functional Safehouse. 2.0 - Red Rocket Safehouses have been redone. All safehouses now have fully functional workbenches and building space. Supply lines currently do not work (I think?). I didn't bother adding them yet due to the purpose of this mod being to add safehouses, not full settlements. Some items are not currently scrappable. Fallout 4 combines worldspace objects for performance reasons. In other words, some objects are literally attached to the map and cannot be moved. There is a setting in the fallout.ini that stops objects from latching on to the worldspace, however this affects performance. Future plans include individually removing these unscrappable objects. I have several planned additions to this mod such as custom Red Rocket Safehouses in areas of the map that do not have one nearby. Any and all suggestions are welcomed in the comments. Big thanks to Ethreon for allowing me to use his modified Red Rocket mesh for the Safehouse in Salem!